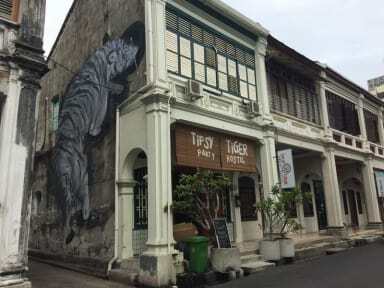 Where in Georgetown, Penang, can you get free drinks, awesome cocktail deals, city heritage tours, beach outings, meet like-minded travellers aka party friends from around the world AND get a good night's rest??? 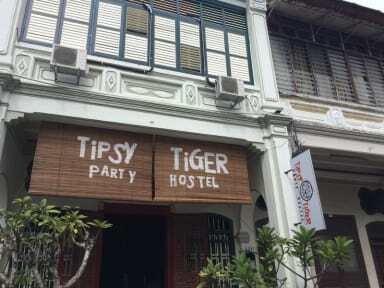 Introducing to you Tipsy Tiger Party Hostel, the one and only party hostel in Penang and probably all of Malaysia. Join us at our bar for a party every night, enjoy our FREE wifi, FREE cocktails, FREE access to an outdoor swimming pool, FREE buffet breakfast ( toast with peanut butter, chocolate breadspread, butter, strawberry jam & Cereal & Organic oats & Pancake and Fruits platter and orange juice) , FREE locker, FREE coffee, FREE tea, FREE hot chocolate, FREE water and get a great rest in our 24 HOURS A/C dormitories and PlayStation 4. Did we mention we also have two resident 'tiger-cats' for you to cuddle up to? ;) And party mafia hosts, cool volunteer programs as well as various tipsy games and stripey fun times... You don't want to miss out on partying with Tipsy Tiger – rock and roar your journey in Penang and book your stay with us NOW! **Please note that hostel will be closed at 11:30pm and we will bring everyone to the next bars! 1. Check-in Time: 13:00 - 23:00. 4. Cancellation Policy: At least 1 day advance notice before the arrival date is required. 5. Age Restriction: This hostel is not suitable for children and we do not accept travelers under the age of 18. 6. The reception is open every day of the week from 8:30am in the morning until 11:30pm. If you’re ever visiting George Town, this is the place to be. Excellent atmosphere for backpackers as you meet loads of people. Staff is super friendly and cool. The hostel is a piece of art with street art everywhere surrounding an awesome bar. They have 2 free drinks every night, and a different happening/deal every night of the week. Rooms have AC and beds are comfy, with every area being cleaned daily. The hostel has also coolest guy on earth running it. Thanks for everything Alex! If you are into wild late night party then this is the place to be.Really enjoyed my stay here. Really good party hostel in a good location in Georgetown. They have cheap drinks, good deals and a really good social atmosphere so really easy to make friends and join in. Breakfast is also included which is a bonus. The staff are all really nice and helpful too. However, a few things- the bathrooms could really do with a revamp, things are broken and dirty. The WiFi is also terrible. Go here for the party, just don’t expect too much else. The epitome of party hostel. This place is fun as a hell, the people that own it and work there are the magnificent humans, and if you want a centrally located hostel that you can also have a lot of fun at nightly on the cheap, you've found a winner. Of course, if you value quiet I might look elsewhere. Do note that you get what you pay for as well! This is a great place for hardy backpackers, but the posh flashpackers may be annoyed when the shower won't work at night (almost every night). This is the best party hostel in Penang. However the showers/water situation was appalling. A party hostel should not have to impact on the very basics of any accommodation, including the ability to wash properly. Work needs to be done on this place, no matter how many free drinks you get. It’s a party hostel with a great social scene and definitely the place to be in the evenings. However, I would advise staying elsewhere because it’s super noisy and the showers never work! Very annoying when so hot! If you want chilled time, that won’t happen here. I would go here to party but stay elsewhere when I go back to Penang. Showers would often just cut out mid shower. Fun place to party but stay somewhere else and then go there for a night out. I love a good party hostel, and the parties were great. Everything else was complete crap. The rooms were brutal dirty was nothing to set them apart or make them at all nice. The lockers were not well secured and were out in the public areas and the rooms had no keys or anything. The big sticking point is the showers and bathrooms, the water is off more often than it's on. If it goes out during the night, no staff member on hand to restart it. Moved out for the final 2 nights of my stay.